Chifeng literally means "Red Mountain". Chifeng is situated at the intersection of northeast and north China economic zones, which is an important part of Bohai Sea economic circle (bó hǎi jīng jì quān 渤海经济圈). 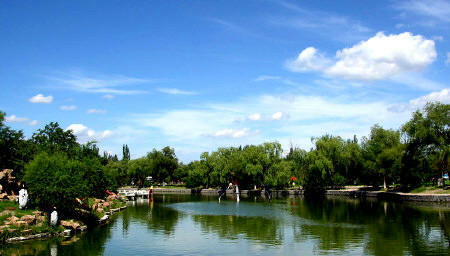 In addition, it is famous for the culture of Red Mountain and regarded as "back garden of Beijing". Being the most populous city in the Inner Mongolian Autonomous Region, Chifeng has a population of 4.6 million, 19.3% of which are Mongolian ethnic group and 73% are Han. Chifeng is in a semi-arid continental monsoon climate zone. Winter is long and cold. Spring is dry and windy. Summer is hot with more rain. Fall is short and frost comes early. In most areas, the annual average temperature is around 0 ~ 7℃. In the coldest month (January), the mean temperature is about -10℃ and the extreme minimum temperature is -27℃. In the hottest month (July), the average temperature is between 20 ~ 24℃. The geographical distribution of annual rainfall affected by topography is very clear and the phenomenon varies greatly in different regions. In most areas the annual sunshine duration is 2700 ~ 3100 hours and from May to September when the sky is cloudless, the daily sunshine duration is 12 ~14 hours. The city has a long history and a profound splendid culture. About 10,000 years ago, human already lived in this area and 8000 years ago, the ancient people named Xinglongwa (xīng lóng wā 兴隆洼) built a village here, which is afterwards called "the first Chinese village" by historians. The famous Red Mountain culture originated here 5,000 years ago and the First Jade of Dragon, which is the landmark of Red Mountain culture, was also excavated from here. About 4,000 years ago, "The First Prairie City" emerged from this place and at the same period, bronze culture in grassland attracted the world`s attention again. Liao Dynasty (liáo dài 辽代) was set up nearly 1,000 years ago and from then on, various cultures have been emerging, several of which became the dominant cultures in Yuan (yuán 元), Ming (míng 明) or Qing (qīng 清) Dynasty. Multi-cultural integration promoted the historical process of this region. The profound history bestowed upon the city a large number of cultural relics. At present, the city has found more than 6800 various cultural sites, which account for nearly half of total sites discovered in Inner Mongolia Autonomous Region. Chifeng has not only a long history, but also a splendid culture. Human activities appeared here as early as 10,000 years ago. Chifeng is one of the important birthplaces of Chinese nation. 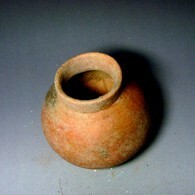 Xinglongwa culture, Zhaobaogou culture (zhào bǎo gōu wén huà 赵宝沟文化), Hongshan culture (hóng shān wén huà 红山文化), Fuhe culture (fù hé wén huà 富河文化), Xiaoheyan culture (xiǎo hé yán wén huà 小河沿文化), the lower and upper Xiajiadian culture (xià jiā diàn shàng céng wén huà 夏家店上层文化, xià jiā diàn xià céng wén huà 夏家店下层文化), Liao (Khitan) culture (liáo wén huà 辽文化), as well as Mongolia Yuan culture are all consistent here. 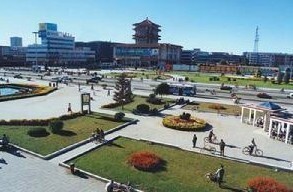 Chifeng is the birthplace of the internationally known Hongshan Culture, known as "the cradle of northern civilization". "The first Chinese dragon", "the first Chinese village", and "the first Prairie City" were all explored and discovered here. It is crucial that Chifeng is the ancient capital of Khitan Empire (qì dān dì guó 契丹帝国), with many historical sites of the Great Liao Empire (dà liáo dì guó 大辽帝国). Hongshan culture can date back to five or six thousands years ago. 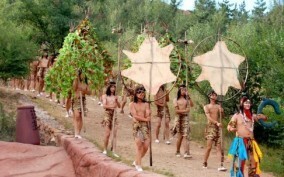 It is an agricultural civilization created by a tribe whose members lived in the north of Yanshan Mountain. It was named after the outskirts of Hongshan sites in Chifeng, which is a city of Inner Mongolia Autonomous Region. 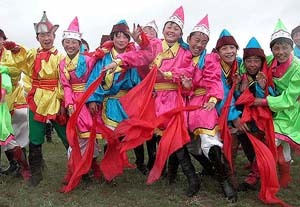 During the beginning period, Hongshan culture was in its heyday in matriarchal society, whose key social structure was composed by tribal groups which were linked by blood strain of women. Gradually the time went into the patriarchal society and the agriculture-based economy integrated animal husbandry, fishing and hunting as one. Hongshan culture originated from west Liaohe river valley (liáo hé liú yù 辽河流域) and it is an advanced civilization. During its development, Hongshan culture communicated and exchanged with Yangshao culture (yǎng sháo wén huà 仰韶文化) and ultimately formed a polynary culture which was full of vitality and creativity. The handicraft industry had reached a higher stage. Meanwhile, the distinctive art of pottery decoration and jade-making began to take shape. Most of painted pottery of Hongshan culture was made of mud and the colors were usually red and black. The pattern was rich and varied and the design was simple and vivid. Jade articles were produced through the process of polishing, which were smooth, bright, charming, professional and standardized. Until now, more than 100 pieces of jade articles of Hongshan culture have been unearthed. One of them is the "C"-shaped dragon unearthed in Hongshan mountain of Chifeng city and it is just the famous jade called "best dragon in the world". Activities: One Hundred people and horses compose a grand team, with the Mongolian heroic and extensive , display the firmness and pride of the prairie people. 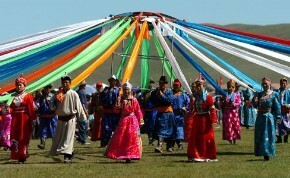 Prairie Cultural Festival has the opening ceremony, Naadam pageant , herdsman visiting, being Mongols for one day, experiencing the nomadic life, the traditional dairy production, the Mongolian wedding performance, Wulanmuqi (wū lán mù qí 乌兰牧骑) performances, films, juvenile music evening, root art pictures exhibition, karaoke concert, as well astourism souvenirs & a series exhibitions and introduction meeting of scenic spots, trade attract investment activities. Location: Gong Geer Prairie, Hexigten Banner (kè shí kè téng yí 克什克腾旗). Activities: Mongolian welcome etiquette of the Qing Dynasty, the palace wedding ceremony, the princess marriage ceremony, performances of palace refined music and the Qing-style costumes show, etc., experiencing the palace welcome ceremony, customs, food culture, Qing-style costumes, exhibitions of Harqin scenery photography and calligraphy and painting, etc., large-scale temple fair and Buddhist activities in the Fuhui Temple (fú huì sì 福会寺), Longquan Temple (lóng quán sì 龙泉寺) and Lingyue Temple (líng yuè sì 灵岳寺), as well as various attract investment activities. Location: In Wangfu town of Harqin Banner (kā lǎ qìn qí wáng fǔ zhèn 喀喇沁旗王府镇). Activities: The activities include the opening ceremony, large-scale theatrical performances, fireworks evening party, a series exhibitions of Hongshan essential relics , Hongshan Culture summit Forum, foreign artgroup's performance, municipal art group's performances, Wulanmu Banner performance, Naadam pageant, Economic and Trade Fair, product trade fairs, large-scale sacrificial ceremony at Hongshan ancestor relics, exhibition and appraisal of Hongshan cultural tourist souvenirs, exhibition of painting, calligraphy and photography of Hongshan Culture, Hongshan cultural special cooking competition, "Summer Carnival" evening party, Hongshan Culture site inspection, geological wonders and grassland sightseeing. Location: Hongshan District (hóng shān qū 红山区), Xincheng District (xīn chéng qū 新城区). Naadam pageant---the most favorite Mongolian sports and amusement activity. Mongolian-style wrestling: (now referred to as "Bork"), no restriction in age, body weight and areas, no time limit, with single knock-out system. Archery: Archery activities originated in ancient hunting. During the long historical process, the function of bow and arrow as hunting tools and weapons gradually disappear, but as a major sports competition for training arm strength and eyesight has lasted till today, and continue to be standardized. Chifeng is known as “back garden of Beijing” and “Dragon’s hometown”. There are abundant natural resources, including desert, forests, grasslands, lakes, hot springs, snow and ice, Moulin, granite stone forest, geological wonders, rare animals and plants, etc. Additionally, the cultural relics, such as "the first village of China", "the first Chinese dragon" and "the first city in Prairie" are also attractive to visitors. Especially the representative Jade called “best dragon in the world” was unearthed from Chifeng and Chifeng is named for Dragon’s hometown consequently. 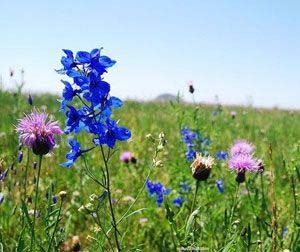 Gongger Granssland is the nearest Mongolian grassland to Beijing, which integrates the beautiful natural landscape and the fascinating Mongolian folkway very well. The grassland is located in Hexigten Banner, possessing one of the extant two Korean spruce woods in the world, which is reputed as the 'living fossil'. The Gongger grassland is a perfect place to watch the beautiful sunrise. 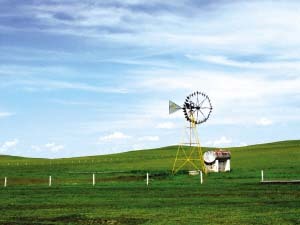 On the grassland, the weather is good and the natural landscape is fascinating. With thriving grass and abundant water, the green of the grassland reaches out as far as your eyes can see. Colorful wild flowers and flocks of sheep that look just like masses of cloud make the scene absolutely beautiful. During the daytime, when you set foot on the grassland, beautiful Mongolian young girls will offer up the pure-white Hada (hǎ dá 哈达) and kumiss (mǎ nǎi jiǔ 马奶酒) to welcome guests with sweet songs. Then you can go out for sightseeing and breathe the natural oxygen. At night, bonfire party is the climax of the evening. Sitting next to the raging flames, you can taste Mongolian roast whole lamb and kumiss and enjoy the authentic ethnic songs and dances. After that, if tired, you can enjoy bathing in the natural hot spring to wash out the fatigue. Accommodation can be offered to tourists and you can live in the unique yurts, villas, wooden cottages to experience the true nomadic nightlife. Wulanbutong grassland is at the southern tip of Hexigten Banner, with a river flowing between it and Saihanba Forest Farm of Weichang County Hebei, 300 km away from Beijing. In the tourist areas there are many scenic spots such as General robe, the site of ancient battlefield, call-officers-roll platform, 12 camps, princess lake, mushroom lake, five-color mountain, and Bashang Grassland. Wulanbutong is a part of Mulan Royal Hunting Ground, known to the world because Qing Emperor Kangxi commanded the war with Galdan Boshugtu Khan here. And for its charming European-style grassland scenery it becomes well-known film base at home and abroad. Here is a staggered area with hills and plains, with organic combination of forests and grasslands; it has the southern beautiful gentle elegance of the South, and the northern powerful rough masculine. It is comfortable here in four seasons, with sceneries everywhere, it is also the place of photography, natural gallery, and open-air photographic studio. Location: Only 300 km away from Beijing, 120 km away from Jingpeng town (jīng péng zhèn 经棚镇). Arshihaty Stone Forest is an important part of Hexigten world geological park and it is a national AAAA-class scenic spots. Geo-park is a quaternary glacier relics carved by the wind with sand through millions of years. 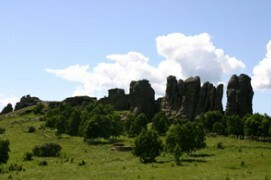 Like an ancient castle, the stone forest is inlaid in the vast grassland. The Arshihaty Stone Forest is located in the north of Hexigten Banner with 105 km away from Jingpeng town and it is the place where the People's government of the Banner is located. In Mongolian, Arshihaty means "steepy peaks". Arshihaty stone forest is the rare granite stone forest in the world and called as the world’s geological wonders by experts because it is the relics of the Quaternary Glacier. Arshihaty stone forest occupies an area of 50,000 square kilometers and measures 1,700 meters high above sea level. It consist of five sections separately called moon castle, swear brothers, eagle with folded wings, the Siege and folk entertainment & living area. In the traveling season, several yurts as well as cattle and sheep groups scattered along the river make the landscape more attractive. Location: In the north of Hexigten Banner with 105 km away from Jingpeng town. The Darryl Lake (Dali Lake), another part of the Hexigten world geological park (kè shí kè téng dì zhì gōng yuán 克什克腾地质公园), is a comprehensive National Nature Reserve, of which the responsibility is to protect rare birds and ecosystems that the birds live by, such as lakes, wetlands, grasslands, sands, and forests. It is located in the northwest of Hexigten Banner with a distance of 90 km away from Xilinhot (xī lín hào tè 锡林浩特). 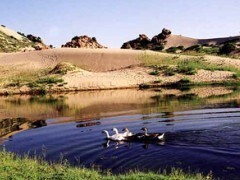 The nature reserve which established in July 1998 has been included in the list of "important wetlands in Asia". Darryl Lake covers an area of 240 square kilometers with a large area of meadow and wetlands. It is a paradise for birds and there are 15 heads, 32 families and 152 kinds of birds perched here and it is also the national reserve for rare birds. Recently, the number of white swans inhabited here has been increased up to a maximum of 70,000, so the lake is also regarded as "Swan Lake". Additionally, abundant historical heritages are around the lake. Location: In the northwest of Hexigten Banner with a distance of 90 km away from Xilinhot. Harqin Palace was built in the 18th year of Emperor Kangxi (1679), with a history of more than 300 years. It is the Mongolian Palace built in Inner Mongolia with the longest history, the largest size, the highest grade, and the best state. It has been completed into Mongolia palace of Qing Dynasty and listed as national key heritage conservation unit by the State Council, and the Mongolian Palace Museum of Qing Dynasty is the national AAAA-class scenic spots. Harqin Palace reflects the regional fractures as well as religious and ethnic characteristics, represents the basic style of the official building in Qing Dynast, with great historical, cultural and scientific value, in 2001 was listed as a key cultural unit by the State Council. Location: 67 km away from Chifeng city. Yulong Sand Lake Tourist Zone, located in the territory of Wengniute Banner (wēng niú tè qí 翁牛特旗), is a national AAA-class scenic spots. The well-known “first Chinese dragon" both at home and abroad was unearthed here. In the Yulong San Lake Tourist Zone is an integrated tourist area integrating grasslands, deserts, lakes, mountains and the Mongolian customs. The most unique here are desert, sand lake, sand pine and singing sand. 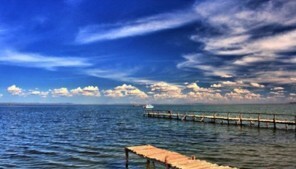 Yulong sand lake is part of the Horqin sandy land (kē ěr qìn shā dì 科尔沁沙地), known as "eight-hundred sand sea". To the north of the sand lake, at in the edge of the endless desert, a strange mountain stands at the ground. The trees and rocks on the mountain vary in shapes. The stones look like pigeon, quail, mushroom, jar, Yin and Yang, and are all vivid. The Huanghua Mountain in the south-west of the lake and Black Mountain in the north-west erect as two huge screens. The famous queer stones on the mountains are camel Buddhism, immortal finger, and dragon door. Location: In the territory of Wengniute Banner, 105 km away from Chifeng city. 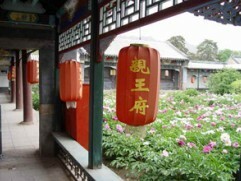 Mantuo Mountain Villa is called as the "first villa of Saibei” (sài běi dì yī zhuāng 塞北第一庄), which is famous for the quaint beautiful scenery as well as rich historical and cultural wonders. It owns not only mountains, rivers, lakes, deserts, jungles, grasslands and other natural beauty, but also has humanistic heritage of Liao and Yuan Dynasty. It combines the modernist style and the ethnic custom together and has become the comprehensive multi-functional tourist resort. Mantuo Mountain Villa lies on the foot of Mantuo Mountain and the south bank of Dali Lake (Darryl Lake) in the west of Hexigten Banner. It collects mountain villa, lake, sand, grass and bosk into a body, forming an unique natural wonderful view. 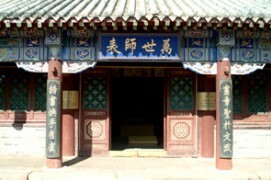 It is centered on Mantuo Mountain Villa, to its east is the site of Longxing Temple of Yuan dynasty (yuán dài lóng xīng sì yí zhǐ 元代龙兴寺遗址), Shuiyun Cave (shuǐ yún dòng 水云洞); to its west is the site of Luwang Palace (lǔ wáng gōng yí zhǐ 鲁王宫遗址), capital of Yuan; to its north is Castle of Genghis Khan (chéng jí sī hán bǎo 成吉思汗堡), etc. The scenery of Mantuo Mountain peak is more unique, rocks erect, lifelike, has more than twenty scenic spots, including Mantuo Great Buddha (màn tuó dà fó 曼陀大佛), boot of Immortals (xiān rén xuē 仙人靴), Shuiyun Cave and so on. Mantuo Mountain Villa has various high, middle and low grade guest rooms, Mongolian yurts, modern sauna bath, big restaurant that can hold 200 people, campfire evening, songs and dances of Mongolian and other recreation items. We await the arrival of domestic and foreign visitors. Location: Mantuo Mountain, Jingpeng Town, Hexigten Banner. Baiyinwula nomadic culture zone, located in the vast Gong Geer grassland, is 120 km away from Jingpeng (jīng péng 经棚) and 38 km away from Arshihaty Stone Forest. Every summer and autumn, people flock on the beautiful Gong Geer grassland which is full of blooming flowers, flourish trees. The herdsmen still live a nomadic life. The simple Mongolian customs, the original production way and eco-lifestyle, food culture are really eye-opener. If you take a stroll on horseback, live in yurts, drink a bowl of milk tea, taste a piece of roast lamb, drink the horse-milk wine and be a real Mongols for one day, you will experience another charm. In recent years, with the flourishing eco-tourism, the tour of rural life, by which the tourists return to nature and experience local customs, gradually rise. A new tourist mode, which shows up the traditional culture of Mongolian herdsmen, and imparts eco- knowledge the herdsmen have accumulated for thousands of years to the tourists, also appears on the Gong Geer grassland. 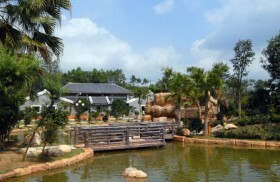 The tourist area identifies 15 "Shepherd House", the family of grassland eco-cultural tourism. 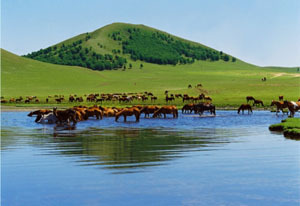 In the "Shepherd House", visitors can participate in recreational activities of the Mongolian characteristics, enjoy the ethnic diet, but also "be a Mongolian for one day", participate in the ecological protection and construction on the grassland, and acquire the knowledge of ecological protection. Locatiojn: 340 km away from Chifeng city. Chifeng is known as "wharf on the land" and the commerce & business are very prosperous. Lots of common Mongolian products can be found here. Except for ordinary specialties, mineral resources especially Bahrain stone will be another good choice for souvenirs. Popular shopping areas in Chifeng are Chifeng Pedestrian Street within the central business district, Tongji Commercial Building, Chengtian Commercial Building, Zijin Commercial Building and other major commercial shopping sites where all the local and surrounding main commodities are available and they are the best places for travelers to purchase local products. 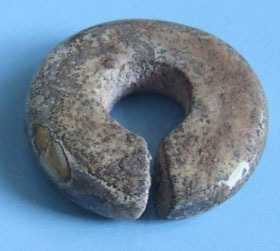 Balin Stone is named for it is produced in Bairin Right Banner (bā lín yòu qí 巴林右旗), Chifeng. Balin Stone has the rich colors and unique texture, and it is soft and moist, very suitable for carving, collection, and viewing. It is the superior stone for sculptors and stone-lovers. 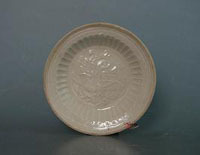 As one of four famous Chinese lithographic stones, it is also listed as candidate China's national stone. Balin quarry is one of the four Chinese colorful stone bases. Various types of crafts, such as carvings, stamps, and natural forms made from Balin stone have always been loved by Chinese and foreign collectors, artists and the professionals in stone paintings. In particular the chicken-blood-colored stone, the nonesuch of Balin stone, is known as "national treasure" and can be called as "rare treasure". The seal of Balin stone become the best gift at the 2001 Shanghai (shàng hǎi 上海) APEC meeting to give to the world leaders. Handmade pure wool tapestry, by virtue of unique creative and technical skills, dexterously combines together the national tapestry weaving technology and world-class art style. The handmade pure wool tapestry, with unique character and perfect artistic realm, can be considered as the best crafts. 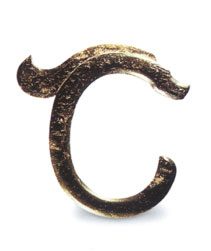 The bronze casting crafts developed by Inner Mongolia Liwang Arts & Crafts Co., Ltd. (lì wáng gōng yì měi shù gōng sī 力王工艺美术公司), are the first domestic product with two national patents. 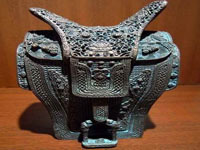 On the basis of antique technology, Liwang bronze crafts are endowed with new culture, with very high art value, and have been identified as the special gift of the party and nation leaders in the foreign affairs activities. The imitated porcelain of Liao Dynasty dedicatedly produced by Liwang combines the Prairie style by the living technology, reflecting the strong ethnic customs, and the simulation is difficult to be recognized. The imitated tri-colored glazed pottery of the Liao Dynasty composed of the three colors as yellow, white, and green has brilliant color, sophisticated idea, with the very value of art appreciation. It is the brilliant reproduction of Chifeng local culture, and becomes the tourist memorial stunner and the best choice of collection and gifts. Besides, you can also purchase other Mongolian local ethnic crafts such as shoes with fantastic embroidery, Mongolian hats, Mongolian musical instruments, bows, ox ornaments, etc which are perfect souvenirs for your Mongolian trip and they could be ideal Christmas gifts for your friends and relatives. All the traditional Mongolian foods like meat and dairy products can be found in Chifeng. A feast of mutton is necessary for celebrations and dairy products are the representative of Mongolian foods. Chifeng flavor foods include baked wheat cake, hada cake (hǎ dá bǐng 哈达饼), shoupa meat (shǒu pá ròu 手扒肉), baked sheep (kǎo quán yáng 烤全羊) and dairy products. It is a transport hub which connects the eastern and western area of Inner Mongolia, the north-east part and the north part of China. It is only 315 km from Beijing to Chifeng. So it is sometimes nicknamed as the "back garden of Beijing." Tianjin (tiān jīn 天津), Shenyang (shěn yáng 沈阳) and other big cities are only 500 km away from the city of Chifeng, while Jinzhou (jǐn zhōu 锦州), Huludao (hú lu dǎo 葫芦岛), Qinhuangdao (qín huáng dǎo 秦皇岛) are less 300 km away from Chifeng. There are 8 provincial or national highways linking Chifeng with surrounding cities. In the south, the railway between Beijing to Tongliao and the railway between Yebaishou (yè bǎi shòu 叶柏寿) to Chifeng converge at here, connecting the north-east part and the north part of China closely. In the north, the railway between Jining (jǐ níng 济宁) to Tongliao and the railway between Chifeng to Dalian (dà lián 大连) intertwine together and ran through the hinterland; there are tourist direct train from Chifeng to Beijing, Harbin (hā ěr bīn 哈尔滨), Shenyang, Dalian, the city of Shanhaiguan (shān hǎi guān 山海关), and non-stop civil aviation flights to Beijing, Hohhot and other cities. There are several railways going through Chifeng city, such as the railways from Beijing to Tongliao, Yebaishou to Chifeng, Jining to Tongliao and Chifeng to Dalian. The city also possesses 8 highways connecting Chifeng to other cities and some tourist direct trains could take you to surrounding cities. The direct civil aviation flights are the best choice to take long-distance trip. Chifeng airport is situated in the southwest outskirt of Chifeng city and the flights to Beijing and Hohhot respectively take fifty minutes and one hour plus ten minutes. Chifeng`s long-distance bus station is located in the square, which is in front of Chifeng railway station, from where visitors can arrive at Beijing, Shenyang, Tianjin and Shijiazhuang. There are two long-distance bus stations in Beijing. One is called Liuliqiao (liù lǐ qiáo 六里桥) long-distance bus station and the other is Xizhimen (xī zhí mén 西直门) long-distance bus station where buses to Chifeng can be found easily. The whole journey will take six hours. 1. In the grassland, the ethnic song and dance performances are available in Mongolian yurts every day and programs that visitors can participate in are bonfire evening party and ethnic singing and dancing. 2. Hexigten Banner (Keshikten Qi) of Chifeng, with profound Mongolian customs, has been praised by Mr. Steve, director of the International Steam Locomotive Association, as "the world's best resort for steam locomotive photography". The section in Hexigten Banner is of complex terrain, with high mountains, steep slope, curved conduits, culverts, and tunnels. When passing this special terrain, the steam locomotive slows down, with the most steam smokes. The steam locomotive like dragon spiting smokes integrates with the fairy-tale beauty of Keshikten in winter, and for such spectacular scenery it is therefore recognized as the best A-class place for photography on this line. Every year, hundreds of thousands of steam photography amateurs come here from all over the world. The best time to take photos is: from December to January.